Coming to PS4, Xbox One, Nintendo Switch, and PC this year. 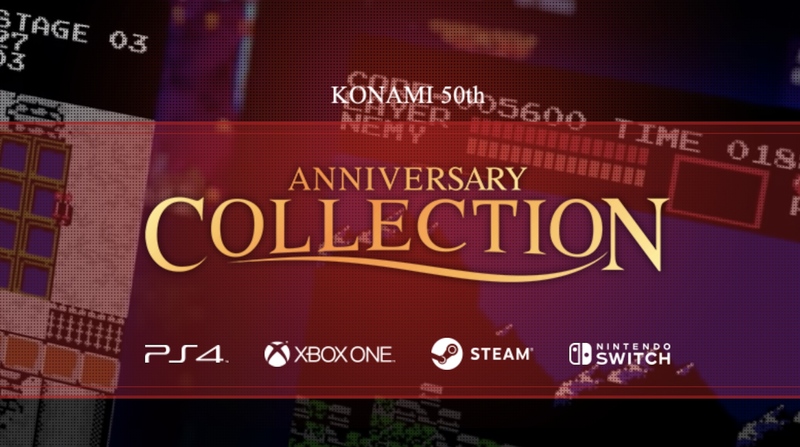 On the occasion of their 50th anniversary as a company this year, Konami will be releasing a trio of anniversary collections on PS4, Xbox One, Nintendo Switch, and PC via Steam. These include the Arcade Classics Anniversary Collection, Contra Anniversary Collection, and Castlevania Anniversary Collection, all three of which will be digital-only releases. Arcade Classics Anniversary Collection will include eight classic arcade titles- Haunted Castle, Thunder Cross, Scramble, Nemesis, Typhoon, Life Force, TwinBee, and Vulcan Venture. The collection will also include an e-book with “new information about the titles, including interviews with the development staff, behind-the-scenes insights, and sketches and design documents never before revealed to the public”. It’ll be priced at $20, and releases on April 18. The Castlevania Anniversary Collection and the Contra Anniversary Collection will also include eight games apiece. For Castlevania Anniversary Collection, the titles announced so far are Castlevania, Castlevania II: Belmont’s Revenge, Castlevania III: Dracula’s Curse, and Super Castlevania IV. For the Contra collection, the games announced so far are Contra, Super Contra, Super C, and Contra III: The Alien Wars. Both collections will also have four additional games that haven’t yet been announced. Prices for neither have been announced yet, and neither have exact release dates, other than an “Early Summer” release window for both. The Castlevania collection will come with a special e-book as well, which will include “details provided by developers, artists and other inspired by the Castlevania legacy”. A “bonus book” is also confirmed for the Contra collection, but details on its contents weren’t provided.